Over the past few weeks, I've been posting my own personal best-of GeekLists covering games from 2000. I'm happy to announce that I'm finally caught up to present day, and I'm ready to hand out hardware for the current year! If this is your first time coming across the Frantic Ferrets, you may be wondering why I give out my 2013 awards in October. It's because most of my favorite games come from Europe, so they usually come out at Essen. So my 2013 awards cover games released from Essen 2012 to September 2013. This way, I give myself a whole year to play the hot Essen games, rather than only a few months. Bear in mind that because of my offset, my definition of "year" may not line up with other awards. Ginkgopolis is a throwback to ten years ago, when games with weird but ingeniously interlocking game systems were all the rage, like Web of Power and Carolus Magnus. It's a game in which new players will be holding their heads in their hands in the first five minutes, and then begging to play again in the last five minutes. Ginkgopolis is a city-building game in which players can expand the city outwards or upwards. Building out is a little easier, but building up is potentially more points, and offers powers that last through the rest of the game. There's also a hand-drafting mechanism similar to 7 Wonders that ensures that games don't bog down into too much AP. What doesn't help is a rulebook that is written more as a reference than a tutorial. It doesn't mention districts, the main driver behind scoring, until the next-to-last page. That's good if you're looking up rules, but bad if you're trying to learn the game from the rulebook. Still, once you get the hang of the rules, this is a marvelous little game, and one that I hope to get to the table for the rest of the year. Friedemann Friese's big 2013 release is one of his best yet. It takes the main mechanisms of Agricola, Dominion, and Through the Ages, and munges it all into a single game. You'd think that the game would wind up feeling derivative, but Friese has cleverly blurred enough lines that Copycat feels completely unique. It really feels nothing like its parent games, occupying a completely unique spot in my collection. 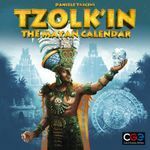 Tzolk'in kicked the door down at Essen 2012, and playing it at BGG.CON that year, I knew it was going to be a contender for game of the year. Its ingenious timing mechanism, using those big plastic gears, requires plenty of delicate strategy and thought. The game rewards good timing. If you can pull all your workers off in the same round, you can probably save valuable time. There is a lot to this game, though. There is a tech tree and a resource system bolted onto the gears, and while it all works wonderfully, there's a bit of the habit of first-time designers to stuff too many mechanisms into the game. I can't help but feel it could have all its power and yet be 30 minutes shorter, with a smaller learning curve. Terra Mystica is a heavy game. I mean, it's physically heavy. You have your choice of fourteen races to play in the game, and each race feels wildly different from the next one. As far as rules and playtime go, it doesn't really compare to the crazy-heavy games of yore like Campaign for North Africa. And once everyone is familiar with the rules, games won't be much longer than a couple of hours if you're playing with three or four. The rules are a bear to teach. There are many, many interlocking mechanisms in the game. And I just dinged Tzolk'in for having so many mechanisms. Why does this game get the trophy? Because Terra Mystica's interlocking mechanisms don't just work; they work beautifully. There are a ton of varied actions you can do, but none of them work in isolation. Going on the cult track can get you power. Building a temple lets you take a favor token, which you can use to boost your income. Building a town can let you snare a valuable Priest, which you can use to increase your shipping. There are so many directions to go here, and they're all so juicy and interesting. I don't give out an award for best family game every year, but there was a clear-cut winner this year. Skyline, which came to lots of people (myself included) as a Kickstarter throw-in to Ground Floor, is actually the best filler game and best dice game of the year, beating out Tasty Minstrel's own Dungeon Roll, which never quite gelled for me. Skyline is a marvelous little game. Like any game of its weight, its rules are pretty easy to explain and understand. Yet it offers plenty of interesting decisions, albeit on a smaller scale than Terra Mystica. Dice games are hard to design. Players have so little control over the game state that their only decision is usually which dice to reroll. In many dice game, that's usually not a very interesting decision. Here, there's enormous risk in rolling your dice, unless you've invested in plenty of ground floors. Even then, there are times you may want to close your eyes and jump off the ledge. There's also an ability to shoot for the moon, because you can end the game if you build a six-story high-rise, and you'll likely win. So games have a healthy amount of swing, and they never feel too short or too long. In fact, it feels pretty natural to play a few games of Skyline in a row. That's always a good sign for a light game. So that's 2013 in a nutshell. The Spiel des Jahres winner this year was Hanabi. I found Hanabi fun, but it never quite scratched the itch for me. It feels a little stressful, with having to come up with an unspoken vocabulary and rhythm for each group. It's a very good game, and deserving of its award, but it's not a game I will insist on constantly bringing out. Sadly, I have not gotten to try the Kennerspiel des Jahres winner, Legends of Andor. Perhaps someday soon.